A professor of race and ethnic studies invested in teaching civic engagement. A first-year student receiving scholarship money for setting up voting registration booths. The director of Community Service Learning. An Ethiopian citizen who wants to make sure Americans don’t take their rights for granted. These are a few of the U of R constituents who have formed a coalition to help register and inform local voters leading up to the November 6 election. About 25 members of the consolidated group are setting up voter registration tables on campus with the goal of removing barriers to voting—making sure students have the information needed to register and vote; providing pamphlets and absentee ballots; and pointing them to resources to learn more about issues they care about. The effort has students from Tilton’s class and student governing body Associated Students of the University of Redlands (ASUR) coordinating volunteers to staff the tables. Community Service Learning has a student worker assigned to the election effort, and is supplying signage, pamphlets, voter registration forms, and tables. Steve Wuhs, professor of political science and assistant provost for internationalization, is also participating. Thanks to these efforts, voting registration booths make an appearance two to three times weekly at University events, residence halls, and other high-traffic areas on campus. 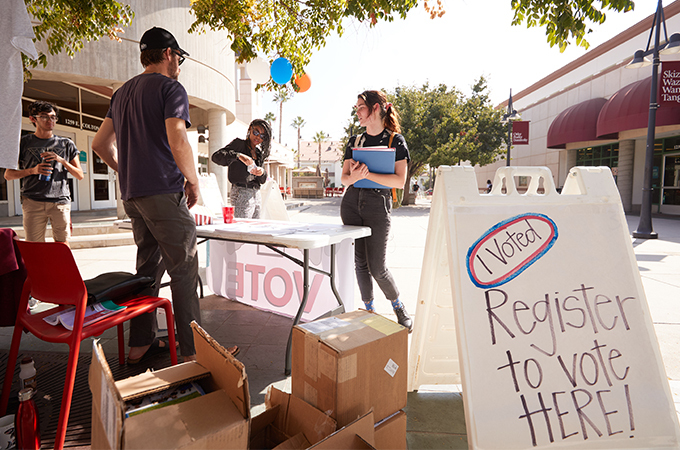 According to Tufts University’s National Study of Learning, Voting, and Engagement (NSLVE), University of Redlands voter participation patterns are similar to those of other colleges, with significant declines in voter participation in midterm elections. While 56.4 percent of eligible U of R students voted in the 2016 election, only 17.8 percent of students voted in the 2014 midterm election. This effort to build more consistent outreach aims to increase both student voter registration and voter turnout in all elections whether students are registered locally, in their hometowns in California, or other states.